Please email or call for addition information, including photos. We will assist with shipping throughout the world and will professionally prepare the car for the journey to its new home. We will also assist with all export matters and paperwork needed at no addition cost. Shipping to Immingham, UK is approximately 700 Euros. Shipping to New York, USA is approximately 1,150 Euros. Shipping to continental Europe is approximately between 300 – 700 Euros. Shipping to St. Petersburg, Russia is approximately 1,000 Euros. Shipping to other cities or countries can be arranged. 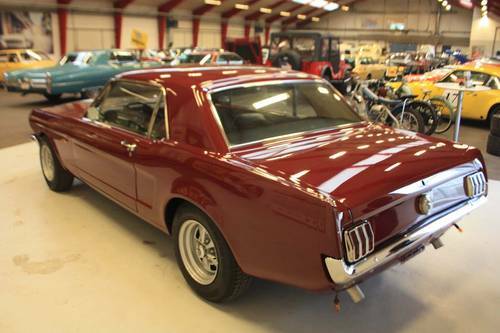 Lee Iacocca is credited with creating the Mustang and started to sell his idea to Ford execs in September 1962. 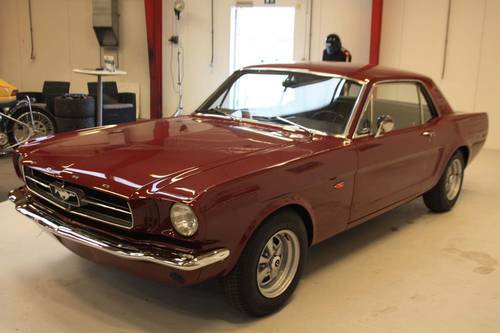 There were, of course, many others involved in creating the Mustang, but he seems to get the accolades. 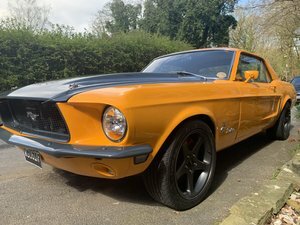 The car was designed to break through the boring barriers of conservative design and appeal to the many young buyers who were now flooding the marketplace for a new car. Iacocca was given the task of studying buyers' moods and his research showed the market was ready for a new, luxurious smaller car to compete against the growing import market in the early 1960s. His solution - build a car with a shorter wheelbase, lengthen the hood, shorten the rear deck and lower the roofline. But first build an affordable car and offer a buyer as many options as possible. Ford's established parameters included that it not be more than 180 inches long, weigh no more than 2,500 pounds, cost under $2,500, and have a standard six-cylinder engine. 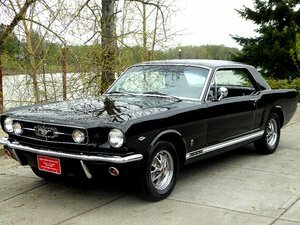 The first Mustang rolled off the assembly line March 9, 1964, and it made its national debut on April 17. With a list price of $2,368, by the weekend, 22,000 cars were ordered and some 303,408 were built that first year. 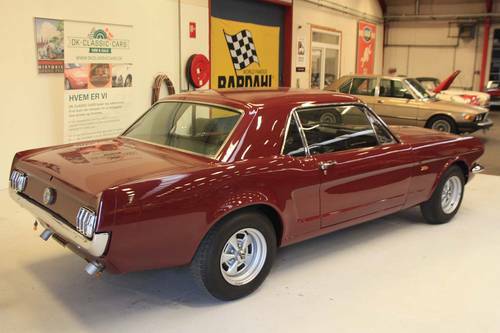 Through 1966, Ford sold more than 1.4 million of them. There were up to 70 options available. 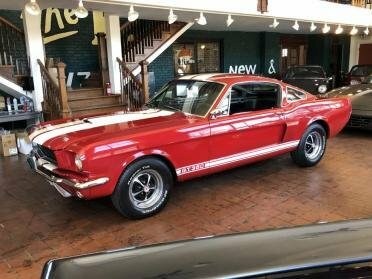 Initially offered only in hardtop and convertible models, a new model was introduced in September 1964, the Fastback 2 + 2, which debuted as one of the three 1965 models. 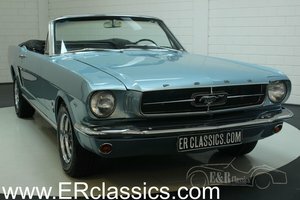 Model year 1965 took off just like 1964 1/2 did with more than 550,000 sold. So, why change a good thing? 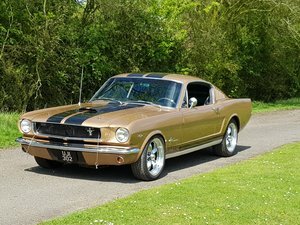 The 1966 model was basically a carryover and on March 2, 1966, less than 24 months after its introduction, the one-millionth Mustang was built. Certainly Ford made up for the Edsel fiasco. 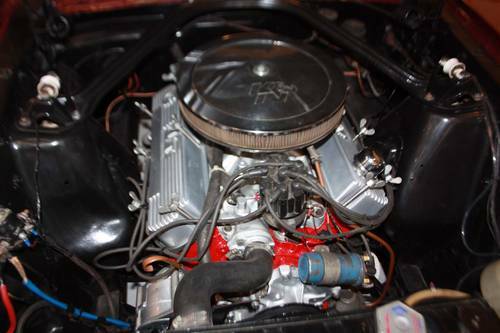 In 1964, the standard engine was the 170-cu.in. straight-six with 101hp and had a 8.7:1 compression ratio. There were three optional V-8s beginning with the 164hp/260-cu.in. engine and a 210hp/289-cu.in. V-8. The top performer was the 271hp/289-cu.in. V-8. This engine featured 10.5 compression, four-barrel carb with manual choke, solid lifters and dual exhaust. 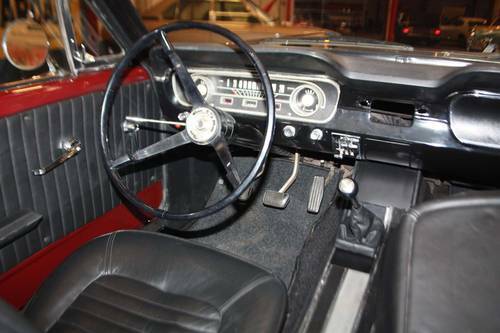 The original Mustang came standard with a three-speed manual floor-mounted transmission. 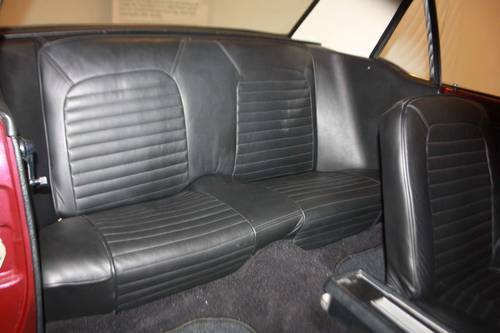 An optional 4-speed was available, as was a Cruise-O-Matic automatic, except with the 271hp V-8. The front suspension featured coil springs, ball joints, strut-stabilized lower control arms and a rubber-bushed ride stabilizer. The rear suspension was comprised of longitudinal leaf springs and diagonally mounted shock absorbers. The rear axle was a semi-floating hypoid and featured permanently lubricated wheel bearings. The steering was recirculating, ball-type with an overall ratio of 27 to 1 and a turning diameter of 38 feet. Brakes were self-adjusting drums, fore and aft. Standard tires were blackwall rayon cord 6.50 x 13. The overall length was 181.6 inches, width was 68.2 inches and height was 51.1 inches. A hardtop weighed in at 2,562 pounds and the convertible was a little heftier at 2,740 pounds.